Very brief post as I don't know how long this story will remain on Sky News for before it's edited... However. 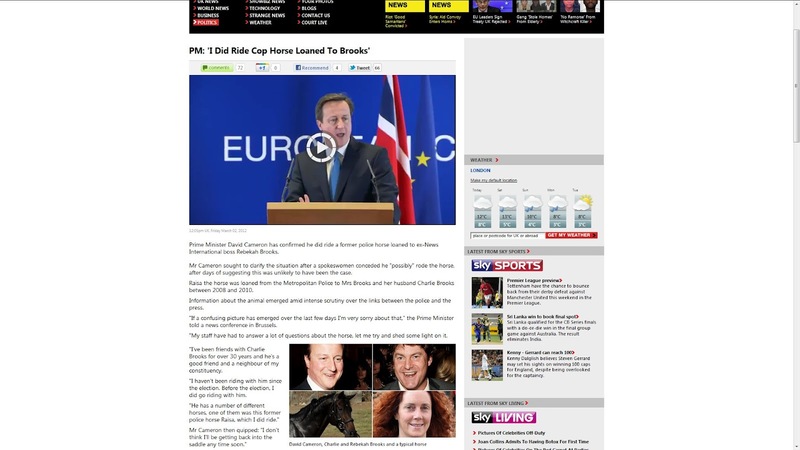 Some sleazy reporter borrowed a police horse or something, and the Prime Minister said he probably rode on it. Now, I get there are probably undertones of corruption and stuff - but I don't care. Politicians & Reporters all seem to be a bit flexible with the truth. Here is the link, but I have screenshots in case it's changed. Obviously, it's a Clicky to Embiggen situation. READ that caption. "A Typical Horse"
Who the buggery needs a picture of "A Typical Horse" ?! But it gets better - usually you read left to right, and look at the images, left to right, as you would in a comic, correct. In which case, top left is David Cameron, Top Right is Charlie Brooks, Bottom Left is Rebekah Brooks, Bottom Right is A Typical Horse. Clearly the simple things in life amuse me too much! Shows what happens when journalists write on the hoof. Sorry!! !